Innovative technologies to quantify seas and coasts for the sustainable use of marine . . .
Seas and coasts are considered key drivers of the economy (Blue Growth) by EU and OECD. Through sustainable exploitation of the marine ecosystem, we ensure a continued contribution to human welfare, instead of overexploitation leading to severe consequences for the natural capital. The key to a sustainable human exploitation of marine resources is precise knowledge of existing conditions and accurate predictions of anthropogenic pressures. 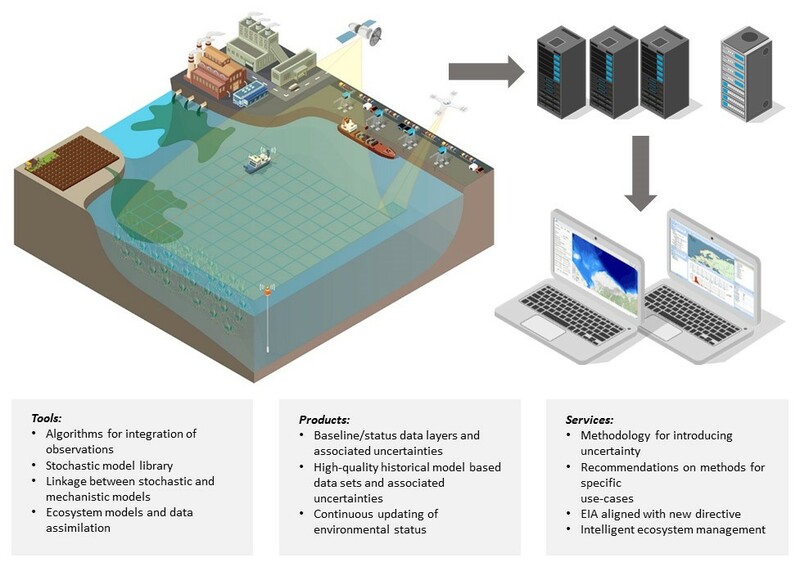 SeaStatus combines innovative monitoring with new models for decision-making to support sustainable exploitation of the marine environment by improving the knowledge base and predictability of management scenarios. SeaStatus addresses the entire value chain from data acquisition, quality assurance, data integration and assimilation (DA) and embeds the developed methods into robust ICT tools (data processing & integration, modelling) readily available for consultants and authorities for new EIA services and efficient and sustainable ecosystem management tools, products and services, which are unavailable today. The project is funded with 10 mio. DKK from the Danish Innovation Fond (IFD) and runs from 2017 - 2020.